Internet, I am not the White Queen, I do not like thinking impossible things before breakfast. So Pillowcastle, with its physics eschewing perspective alteration, was decidedly unwelcome with my Shreddies. However, when I was done with my delicious cereal I was quite taken aback by how utterly brilliant it was. The talented team behind Pillocastle have made a game in which your perspective changes the scale and properties of an object. The best way to understand is simply to see the thing in action. It’s for games like this that the word flabbergasted was invented. As a concept Pillowcastle is certainly compelling. With such a novel player power you get the sense that the developer can make great mind-bending puzzles but it’s a long way from a cool game mechanic to a good game. I’d love to see what else the team have up their sleeves besides the tech demo above. The team have extended the idea beyond its core concepts, too. For instance, the way that an objects properties are linked to its scale. They use the example of a desk fan, where the air blasts out more strongly as its size increases. But that principle could be applied to a candle (have the thing produce more heat) or an ice cube (leading to a Futurama-esque puzzle solution). I’m still struggling to get my head around the portals. I thought, after to Portal games, that I knew how to think with portals. Apparently, if you throw scale into the mix then I lose all sense of perspective once more. 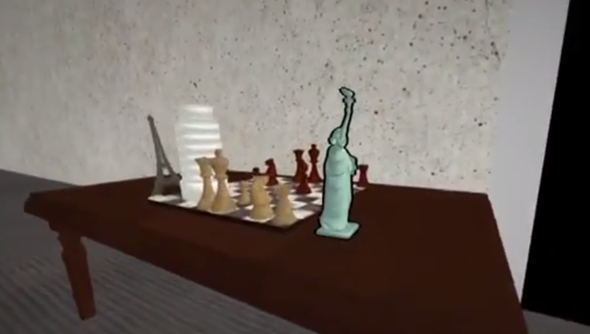 The game is in development by a team of students over at Carnegie Mellon. It’s the first thing in a while that’s had me wanting Valve to return to Portal and make another game of rigorous test chambers and mind-breaking lateral thinking exercises. That’s no reason why Pillowcastle shouldn’t be developed. It’s a great idea for a game and if they can work it into a good, challenging fully-fledged game then I’d happily spend some hours playing with it.